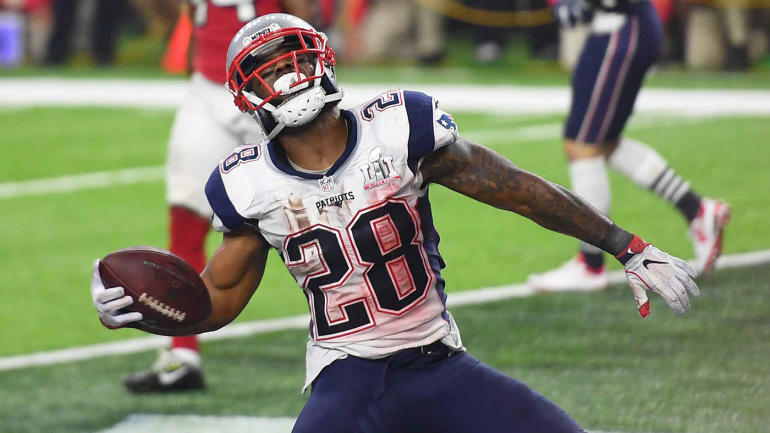 James White was one of the Patriots' heroes in last year's Super Bowl. New England is trying to win 3 out of 4 Super Bowls for the second time this century, both times against the Eagles. For most of the two weeks leading up to Super Bowl LII, I drank quite a bit of green Cool-Aid. But now, my stomach is full, and my brain is slowly beginning to see things clearly again: the New England Patriots are about to polish off a sequel to their mid-2000’s dynasty. Yes, it’s been a long struggle with the death of parity in the NFL for me. You see, I happened to start watching the NFL at the worst possible time. If your first full NFL season was 1999, you were lured into a false impression that stories like the Kurt Warner-led St. Louis Rams could happen frequently. The 2000 Baltimore Ravens, 2002 Tampa Bay Buccaneers, and, yes, even the 2001 New England Patriots were fairy tales by comparison to many of the teams that have won since. Let’s face facts: Nick Foles is not nearly as good as Carson Wentz. Were Wentz playing in this game, we’d be talking about a legitimate chance for Philly to capture its first Lombardi trophy. But those hopes and dreams died on December 10 while simultaneously catapulting the Patriots to another title. Some of the outside world seems to think this could be “the end” for the Patriots, with their 40-year old quarterback and soon-to-depart coordinators, which of course is garbage, but at the same time it is fair to wonder if the Patriots are using that narrative as added motivation. In 2004, the Patriots won their third championship in four years. They beat an NFC West champion, then two years later an NFC South champion down in Houston, and then the Eagles. They are gunning for the same fate in 2017, and their biggest obstacle, Wentz, has been removed from their path. There are a few other reasons why I am starting to lean much more heavily towards New England than just the likely-garbage notion that the end is near. For starters, how about the fears of avoiding another giant hole as they did in last year’s Super Bowl? One thing I am certain of is that the Eagles would be able to hold a 28-3 lead unlike the Falcons, so the Patriots will tailor their gameplan to ensure a faster start, even though they are the kings of letting their opponent land the first punch so they can accurately gauge what adjustments to make. Another reason is that the Pats will be seeing a very similar foe to one they were able to adjust so well to in their last game. The Eagles are a little bit better than the Jaguars, but both have a similar style of defense that in theory could give New England trouble, but now New England has a frame of reference. The symmetry aspect is always present for the Patriots. Every achievement during this dynasty has felt more like a magical fairy tale than true sports dominance. Whether it’s the greatest comeback, the greatest escape, the “three out of four twice” element, something is always available to be dissected as pure pixie dust, or come full circle from the beginning of this miraculous run. I remember assessing all of New England’s possible Super Bowl foes before the postseason began, and realized that Philadelphia would provide the greatest opportunity for symmetry of all. The Rams would have been interesting because the “full circle” story could have been used since they were the team Brady beat for his first ring. The Falcons would have allowed the Patriots to join the 1992-93 Cowboys (the only other team to win three out of four in the Super Bowl era) as teams to beat the same club in consecutive years. The Vikings would have allowed the Patriots to be the truest “road warrior” ever by winning a true road Super Bowl. But nothing compares to the Eagles being the team that allows the Pats to achieve the three out of four feat twice. If there’s one thing we’ve learned from past Super Bowls, it’s that New England doesn’t like playing in boring ones. Every one of the franchise’s seven appearances with Brady/Belichick have been decided by six points or less. The least exciting of all seven was probably Super Bowl XXXIX against the Eagles, with the final score not accurately depicting how much the Patriots controlled the second half. But after sitting on the fence for about 10 days as to whether the Patriots’ defense wasn’t all that good, that the offensive line had problems, that the Patriots have had one of the easiest Super Bowl paths ever, I’ve come to this conclusion: they are basically a better team than the one that couldn’t be buried at 28-3 last year. Oh, and that was without Rob Gronkowski, who will play this time around. Okay, so Julian Edelman is out, he of the wildest catch in Super Bowl history last year (notice I said “wildest,” I didn’t say “best” since I believe that still belongs to David Tyree). But guess who is in? Brandin Cooks. I’ll trade Edelman for Gronkowski and Cooks any day. The defense is missing Dont’a Hightower, and that is significant, especially when you consider he has made game-changing plays in the team’s last two Super Bowl victories. But like with Gronk last year, the team has had time to adjust to life without him. Defensive coordinator Matt Patricia is getting much better production out of Stephon Gilmore, and now has a motivated James Harrison at his disposal. LeGarrette Blount is on the Eagles now, but remember he wasn’t a big factor in last year’s win, and also fumbled early in the game. And really, is anything bigger than the Nick Foles-Tom Brady matchup? I simply cannot see Foles being the only quarterback other than Eli Manning to knock off Lord Brady on the game’s biggest stage. Wentz, absolutely. But Matt Ryan couldn’t do it. Neither could Russell Wilson, nor could Donovan McNabb, Kurt Warner, or the Ragin’ Cajun, Jake Delhomme. What shot does Foles have? In the past, I’ve broken my Super Bowl predictions down into the categories of offense, defense, special teams, coaching, and intangibles. But you basically know the drill. The Patriots have the edge in every category except for maybe defense. They’ve got the experience, the desire, the mental edge, the maniacally focused and driven head coach and quarterback, and a world of haters to fuel their motivation. The Eagles are 0-2 in Super Bowls, and it would only be fitting that they not only go to 0-3 to further damage a heartbroken sports city, but 0-2 against the Patriots to balance out the fact that the Patriots are 0-2 against another NFC East team in Super Bowls. Plus, it might actually be safer for teh city of Philadelphia if the Eagles don’t win this game. I’ve been so spot on in picking championship games and series in recent years, and if I was ever going to have the string broken, I’d gladly have it be by the Patriots. The only dilemma left is whether New England will cover the spread, or if the Eagles will lose by a gentlemanly four. I’ll give some point generosity to Philadelphia in this one, but little else. Prediction: Patriots 27, Eagles 23. Be the first to comment on "Super Bowl LII: Symmetrical Bliss for Brady, Belichick"